Your teeth do a lot for you. Everyday, they allow you to chew the nutritious food you need, pronounce words and speak clearly, and smile at friends, family and even strangers. 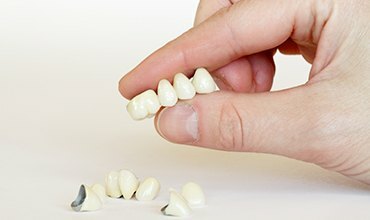 What would happen if some or all of your teeth were missing? The American College of Prosthodontists estimates that approximately 175 million Americans are missing at least one tooth, and over 35 million are missing all of their teeth. If you are in one of these groups, then it’s time to talk to Dr. Freyne about dentures in Chevy Chase. Many people rejuvenate their smiles with partial or full dentures. Dr. Freyne will help you decide if one of these tooth replacement options is the right solution for you. For patients missing one or a few teeth, a partial denture could be a workable and affordable solution. Dr. Freyne will recommend either a removable or a fixed partial—more commonly called a bridge—depending on your situation. A removable partial consists of false teeth that are attached to a metal frame. The frame has clips or brackets that hook on to healthy teeth in order to hold the partial firmly in place. A partial can be designed to replace consecutive or non-consecutive tooth loss. The partial’s false teeth are made according to an impression we take of your mouth. This way, your new teeth look natural and fit comfortably between your other teeth. A fixed partial or bridge is a single unit made of two dental crowns with a false tooth or teeth in between. The crowns are placed over healthy teeth on both sides of the gap in your smile in order to hold the false tooth in place. If your own teeth cannot be used, then the crowns can also be attached to dental implants. For patients who are edentulous—missing all of their teeth—there are full dentures. This oral device can be made to fit either your upper or lower arch and are comprised of false teeth set on an acrylic base that is shaded to look like you own gums. If you’re missing all of the teeth along your upper ridge, then a denture with an open palate may be designed to afford you greater comfort and a better sense of taste. In any case, your dentist in Chevy Chase will make sure your dentures fit comfortably and securely without causing irritation to delicate gum tissue. 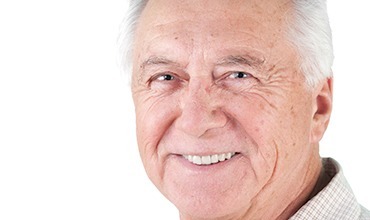 For even greater confidence when you eat and talk, ask Dr. Freyne about implant-retained dentures. These are attached to implants surgically embedded in your jawbone and are often a better alternative to traditional dentures.